Large-size slabs in concrete-effect porcelain stoneware. Concrete Grey is inspired by plain concrete with its vigorous, natural appeal. The delicate contrasts of the graphics create a contemporary solution that adds a touch of modernity to any setting. Versatile cuts and geometric motifs for every design requirement. The slabs are available in a silk finish with a thickness of 12 mm. 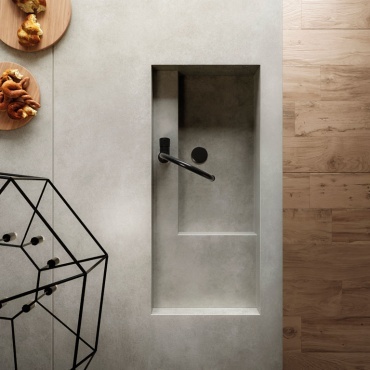 Ideal for use in indoor as well as outdoor spaces: from kitchen worktops to ventilated façades, where the use of a material with industrial overtones delivers on-trend metropolitan design. Concrete Grey Habitat. For this kitchen composition, Concrete Grey silk is paired with Etic Pro Rovere Venice by Atlas Concorde for a wood-effect floor. The mood is based on the fusion of natural elements and colours: wood, concrete and vegetation express the essence of tactile materials. 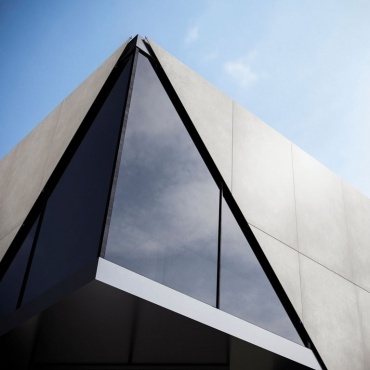 The architectural elegance of the ventilated façade goes perfectly with the exterior environment.